The midseason finale of Legends of Tomorrow begins with a younger Martin Stein in line at a toy store, wanting to purchase a Beebo doll (which is apparently the hottest toy that holiday season). He wants to get it for Lily for Hanukkah. He gets his hands on the last Beebo in the store and is chased by a hoard of angry parents when... he’s zapped out of the toy store and into the past, where he’s now being chased by angry Vikings. Yikes! Leo Snart is on board the Waverider which is lovely and I want him to stay forever. We see this different, “cuddlier” Snart talking with the Legends via a Martin Stein puppet — a way of dealing with their feelings about losing their friend. Jax isn’t in the mood for puppets or anything, really. He blames himself for Martin’s death. They then get interrupted by a new anachronism which is the young Martin Stein running afoul of the Vikings in the “new world” (a.k.a., America). The anachronism is so bad that in this version of time, the Vikings stay in America and it’s called New Vahalla. The Legends travel back to see what causes Leif Eriksen to decide to stay in the new world, rather than going back to Greenland. They discover the anachronism is Martin and believe the Vikings used his genius to conquer the new world. They save Martin and want to get out of there but he tells them about Beebo. He tries to tell them the toy is what changes history, but they’re not listening. It’s true, though — the Vikings are worshiping the talking Beebo doll. Because of course they are. I love this show. Back on the Waverider, Martin explains to the Legends what happened. Beebo is what kept the Vikings from killing him when they chased him in the forest. Apparently, Leif’s sister is the ringleader in this new “cult,” using the doll to assert her own power and influence. The young Martin, meanwhile, wants to know where his older self is and they lie to him, telling him he’s home with his family for the holidays. Nate and Jax are concerned that they keep running into themselves in the past. Jax wonders if this means they should try to change and improve things. Ray and Amaya caution him against thinking that way but he doesn't want to hear it. Mick is outraged to discover that Leo has turned the Waverider into a “dry” ship — no booze on board. He wants his friend to try sobriety for a change. Mick is unsure of that. Meanwhile, the rest of the Legends are coming up with a plan on how to deal with the Vikings when they get a transmission from Agent Sharp. She and Sara banter a bit (I am detecting chemistry there) before Sharp expresses her condolences for Martin. Sara learns that Christmas is now called Beebo Day. Sara tells Sharp that Beebo Day is part of the anachronism. Then she asks for Sharp’s help. The Legends dress up as Vikings and go meet up with the other Vikings. All they had to do was show up with booze and they were welcomed like old friends. 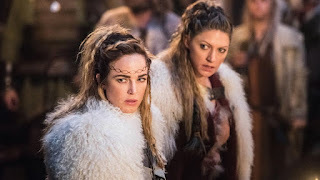 Mick and Leo have a disagreement over booze — which Leif’s sister overhears — so she finds Mick as he’s about to bring Beebo back to the Waverider and takes him prisoner. The Vikings set Mick up to be judged by Beebo. The little blue doll says he’s hungry so, clearly, Mick must be burnt on the pyre. Before they can light Mick on fire, Leo puts out the flames with his cold gun. Sharp, thinking quick, declares it a sign that Beebo doesn’t want their clansman to be burned. The doll speaks, saying he loves them, and a fight breaks out between the Legends and the Vikings, lead by Leif’s crazy sister. Over on the Waverider, Zari is trying to distract Jax by playing video games with him. He still wants to warn Martin, however, and Zari understands. She thinks he should do what he wants. When young Martin asks to be taken back to his proper time, Jax realizes he has a chance to save his friend. The battle with the Vikings is fierce. In the uproar, Nate grabs Beebo. He tosses it to Ray, who gets tackled and the doll goes flying. Then Mick melts it with his fire gun. The Vikings see Beebo for what he is, at last: a false god. Sharp says the Legends saved Odin Day. Apparently, the anachronism wasn’t fixed after all. At that moment, Odin arrives and it’s... Damien Darhk. Of course! The Legends retreat to the Waverider because they can’t really fight Darhk right now. But in the temporal zone, the time quakes are getting worse as the anachronism grows. Jax is taking young Martin back to Central City via a shuttle. Jax tries to pull a Back to the Future and give Martin a letter to open in the future — to warn him. But Martin won’t do it. He knows the team was lying about him being okay in the future. He doesn’t want to mess with time. Jax pleads with him and he takes the letter when he sees how much it means to his future partner. Mick and Leo tussle some more about the lack of booze on the ship and Leo tries to tell his doppelganger friend that he came on board to deal with his own issues about losing his friend. They argue and the two of these guys are legit amazing. I want to keep them like this. Can we? Sharp tells Sara that Rip is in trouble with the Bureau, but Darhk is a bigger threat. She tells her that Grodd survived Vietnam and is traveling through time, messing things up left and right. Sara wants Sharp to stay on the Waverider and help them, but she can’t. She warns her to pick her battles before she leaves. Sara gathers the Legends for a meeting and tells them that they have no back-up when it comes to confronting Darhk, and she doesn’t want to lose anyone else. Sara wants them to take the Waverider and go — to leave her alone with the Vikings. She has a plan but the team doesn’t like it. They run through several scenarios and realize they need to do this together or not at all. So they go in, just as they planned, but this time they have a secret weapon. It’s Beebo! Well, it looks like Beebo at least, but a mini Ray Palmer is inside controlling him and making him fly and speak. When the Vikings are distracted by that, Leo and Mick take on Nora Darhk and knock her out. The Vikings and the Legends go into battle and Darhk, upset about his daughter, takes her and is about to heal her when Sara claps a hand on his shoulder. She’s instantly transported to a strange plane of existence where an evil voice (Mollus, the evil that was mentioned back in the premiere) speaks to her about how her world is going to end. Sharp pulls her out and she sees the Vikings are defeated, Darhk is gone, and the anachronism is fixed. On the Waverider, Sara tells Sharp what happened in that strange plane — how it was completely devoid of happiness and love and anything good. Sharp leaves to tell the Bureau and Rip what happened and Gideon confirms that everything is fixed... for now. Jax, however, is upset to learn that Stein still dies in 2017. Zari tells him that Martin must not have read the letter. So Jax goes back to 1992 to see him (and to bring Lily a Beebo). Martin tells Jax that he burnt the letter. He tells him that he’ll be 67 years old in 2017 — having lived a full life and seen his daughter grow. Martin wants Jax to let him go. He says he has no regrets for his life, and thinks he has a full one with plenty of adventure. Martin then tells Jax to live his life, and have all the happiness he deserves. Jax is upset, but understands, and he shakes Martin’s hand before returning to the Waverider. Jax goes to see Sara, tells her he wasn’t able to change Martin’s fate. He also tells her that he has to leave the Waverider and the Legends. She’s incredulous. She doesn’t want him to leave because he’s a part of the team. He says that right now, he has to do this. He needs a different kind of adventure but it sounds like he might be back at some point. They hug and Sara promises not to tell the others he’s gone until after he’s left. Regretfully, she watches him go. Before he goes, he stops by Martin’s lab to say goodbye and the team surprises him. They’re not going to let him go without a goodbye and they insist on celebrating the holidays with him before he leaves. Leo even lets Mick drink alcohol again. They have a big meal together and Jax tells the rest of the Legends that they help him not feel so broken anymore, and that they’re a family. He’ll always have them. They toast and that is that. Sara drops Jax off in 2017 and it’s a tearful goodbye. I hope he comes back soon. On the Waverider, Sara is surprised by Constantine. He has a request for her — he needs her help with a demon that’s possessing a little girl. And the demon knows her name. Would that be Mollus? I’m sad the show won’t be back until February. I gotta say, I love me some Legends of Tomorrow. It’s a beautiful balance of humor and heart with great characters and even greater chemistry. Jax said this rag-tag team felt like his family and I know just what he means. Again, if you haven’t watched this show lately, give it a try while it’s on this long break. You might be surprised by what you see!